Double Taxation Avoidance Agreement - How to avoid paying taxes twice? You are here: Home / Tax Planning / What is Double Taxation Avoidance Agreement (DTAA)? | Is Income earned outside India Taxable? What is Double Taxation Avoidance Agreement (DTAA)? | Is Income earned outside India Taxable? It is undoubtedly true that the World has become a Global village! Business is becoming increasingly international and multinational companies do business across the world. Many of us do get opportunities to work in different countries. It has also been increasingly easy to invest in assets (financial or physical) of foreign countries. Examples : You are a Resident Indian working for an IT MNC and drawing salary in Indian rupees. In the middle of a Financial year, you may get a foreign assignment where you have to work for an US subsidiary and your salary is payable in USD (foreign income). You may be an NRI (in USA) drawing salary in USA and have rental income here in India. You can be an OCI (Overseas Citizen of India) with foreign income as well as income from assets in India….. So, in these kind of scenarios, how is your income taxed? Is income earned outside India taxable? Do you need to pay taxes in both the countries? If that is the case, then tax rates can be as high as say 30 – 75% of your income/gains. Is n’t this ridiculous? To avoid double taxation or to get relief from double tax, we need to know a concept called ‘Double Taxation Avoidance Agreement’. Let’s first discuss some basics about – how taxation is levied? What is Residential Status? Who is a Resident Indian/NRI? Source Rule : The place where it is earned / accrued. As per this rule, income is to be taxed in the country where it originates. Here, the place of residence / citizenship (Residential Status) does not matter. Residence Rule : As per this rule, the tax is levied by the country in which the tax payer resides. In India, tax is levied based on both the rules. The Source rule is applied for NRIs (Non-Resident Indians), whereas the Residence rule is applied for Resident Indians. So, how is residential status determined in India? Who is an RI / NRI? 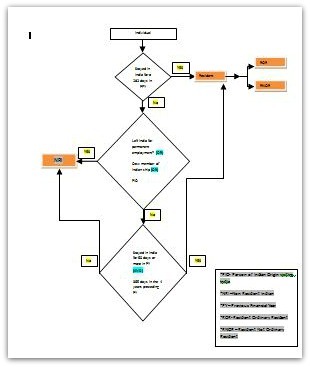 Kindly click on the below flow-chart (document) to open it in a new browser window. How is Residential Status determined? You may kindly use the below online calculator to check if you are an NRI or Resident Indian (RI). Based on the above calculator you can find out if you are an RI or NRI. In these kind of scenarios, DTAA would come into the picture. DTAA is a Tax Treaty and is a bilateral economic agreement between two nations that aims to avoid (or) eliminate double taxation of the same income in two countries. In simple terms, DTAA is an agreement entered between two countries so that the citizens of those countries need not pay taxes on same income in two countries. If you are a RI and have only Indian income, no issues with double taxation. Your income is taxable in India only. If you are a RI and have both types of income, then DTAA can be referred to. 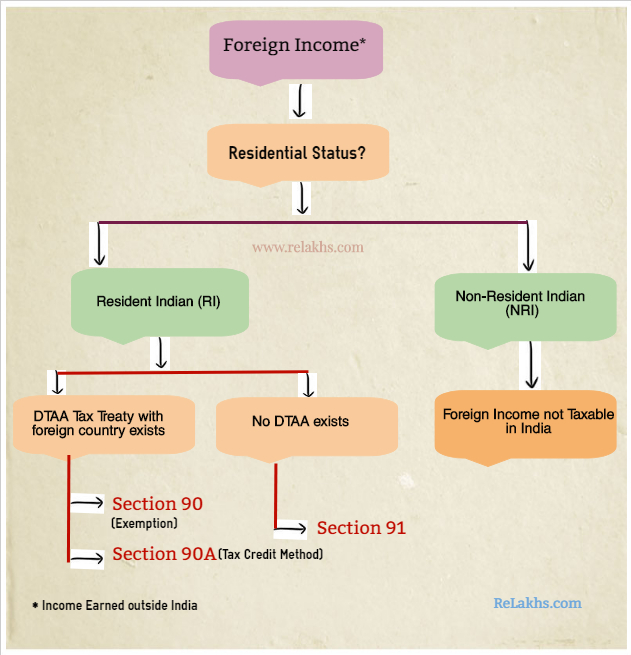 Your foreign income and Indian income is liable to tax in India. 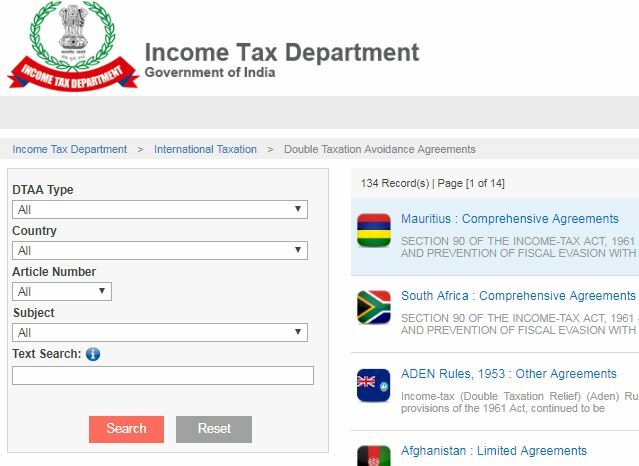 So, you need to refer to relevant DTAA tax treaty (if any). Section 90 (Exemption Method) : The applicable income is taxable only in one of the two countries and is exempted in another country. Here, the Source rule is applicable. For example : The Interest income received by a citizen of UAE from India is taxable in India only. 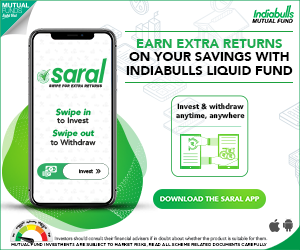 Like-wise, if a Resident Indian receives interest income from UAE, such income is taxable in UAE only and is not taxable in India (even if you are an RI). Under this method, the income is taxable in both the countries. But, the country of residence will allow you to claim Tax Credit (tax deduction / tax relief) for the tax that you have already paid in country of Source. For example : As per your current residential status, let’s say that you are a resident Indian. You receive salary from an US company for the job you rendered in the USA. As US follows ‘Source Rule’, your income is taxable in the USA at applicable tax rates. At the same time, since you are RI, your global income is also taxable in India. While filing your income tax return in India, you are allowed to sett-off (claim tax credit) against your total tax liability but limited to the tax payable on such foreign income at Indian tax rates. Another important point which has to be noted is, in case where Bilateral agreement has been entered u/s 90 with a foreign country then the assessee has an option either to be taxed as per the Double Taxation Avoidance Agreement (or) as per the normal provisions of Income Tax Act 1961, whichever is more favorable to the Tax Assessee. If there is no DTAA between both the countries, you can claim tax relief from double taxation under Section 91. However, kindly note that tax relief u/s 91 is available for Resident Indians only (and not to NRIs). Under this section, Indian rate of tax (or) the rate of tax of the said country, whichever is the lower, is considered. If you are an NRI who has Indian income then such income is taxable in India. If you are an NRI and has foreign income then such income is not taxable in India. If you are receiving income from the sources which are located in multiple nations, and in case, you believe that you may end up paying taxes twice on the same income, suggest you to kindly take help of a tax expert and then file your income tax return(s) accordingly. Which ITR form to file (FY 2016-17 / AY 2017-18)? Is this really genuine way to be taxed – when USA follows financial year Jan-Dec and India Apr-Mar? The Jan-Mar quarter earnings always going to be overlapped while filing in US as well as in India? Will I be taxed on both the incomes for the FY. Can I apply for tax exemption under DTAA policy. If I plan for a personal trip abroad for 3-4 days before March-17, will it help me retain the status as NRI. Please let me know your reply on the above. Do you mean to say till 31-Mar-2018? >= 182 days stay in India, can turn your residential status to Resident Indian. Anything less than 182 days can make you maintain NRI status for the FY 2017-18. India has a DTAA aggrement with China. So, double taxation can be avoided. Suggest you to kindly consult a CA who deals with NRI taxation matters. Request you to please let me know If I plan for a personal trip abroad for 3-4 days before 31-March-18, will it help me retain the status as NRI. I believe you can do so (personal trip). But my suggestion is to kindly check with a CA and plan it. Thanks a lot Sreekant, for quick reply. Appreciate it. what is the status of taxation of the interest in a NRE/NRI/NRO account accrued over money earned abroad in a country with DTAA agreement with india, the money already been taxed out there. the acoount still exists but the residential status is now RI. Dear Chetan..As the residential status is RI, these need to be converted to Rupee Savings a/c and the interest income is taxable. 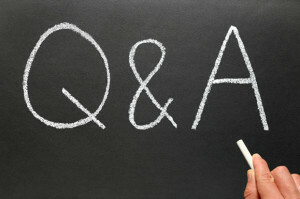 Loved the article but are you planning to go deeper into this subject? Dear cvan ..The purpose of THIS article is to present the basic knowledge on double taxation only, as I have noticed that some of my friends & blog readers do not know much about DTAA and end up paying taxes twice on the same income. It is a bit tough task to discuss on the nitty gritty of tax treaties, tax rates etc., I believe its better and advisable that we leave it to the taxation experts. Hope, you agree with my opinion.